The logo for the line of Gucci Guilty items strikes me immediately as a Bat-symbol. I am not by nature litigious and I don't customarily give business advice to multimillion dollar corporations but, if I were DC Comics, I would either sue Gucci to cease and desist or else demand that DC receive a cut of the profits. While in negotiations maybe the two companies could agree to tweak the Guilty logo ever-so-slightly and legitimately call the stuff Gucci Batman. Why not? You're right--I never thought about the cut-and-paste nature of this cover either till you pointed it out, so it is a question that nobody I know has asked me before. Since the cover of a first issue would hardly be parceled out to a young staffer (the Woodchucks were quite young and inexperienced at this point), and the machine guns are convincingly rendered, I figure it was one of their A-list guys. 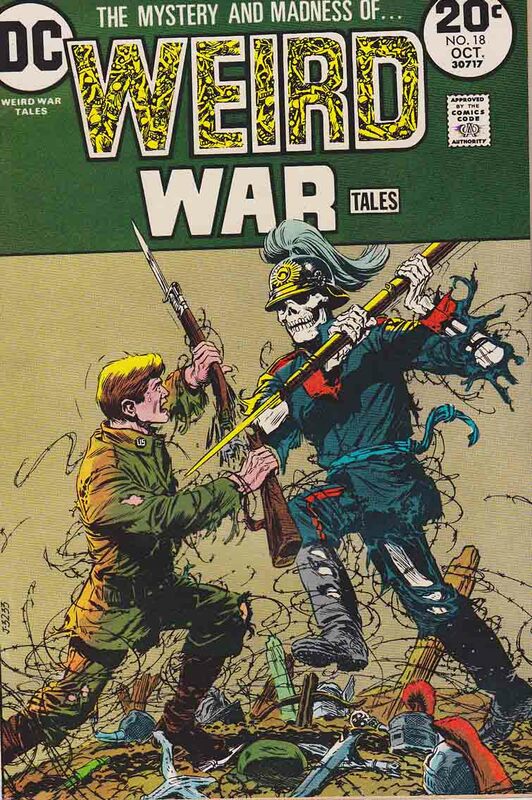 Since it isn't Kubert, who'd have been the obvious choice, my guess is that it's Nick Cardy who was called upon to provide the lower third of the cover--since he was tasked with providing almost all the covers on the rest of the line at the time, and because that's who the inking on the hands suggests. As a staff artist, he'd have been the one Nelson [Bridwell] would've gone to first, I believe. I appreciated the input from those gents but the artwork just didn't look like Kubert or Orlando or Cardy to me so I went back to square one and put my thinking cap back on. I asked myself what artists were adept at drawing technical details accurately from reference material. The machine guns on the above cover are very convincingly drawn, after all! In no time at all the name George Evans came to me. I felt far more comfortable with the above gunmen being by Mr. Evans than those other three artists, and the below Weird War Tales cover from the same exact month displays more evidence of detailed gun-drawing. I'm not surprised to be wrong, given the small amount of material to work with, but the obvious answer turns out to be the erroneous one. According to John Wells, who went to the original art which had been on Heritage's auction site, the perpetrator of the lower third of the BC #1 cover is none other than Luis Dominguez, the other regular DC cover artist. Though his tenure as #1 cover artist only started when Cardy left, I guess he had to start somewhere. 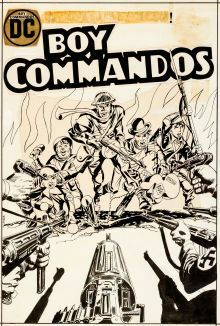 The Boy Commandos by Joe Simon and Jack Kirby were introduced in 1942's Detective Comics #64 and they were awarded their own comic book in less than a year. The cover of their first solo issue is seen above (with its bold and daring color scheme), and that series ran 36 issues before ending in 1949. The boys were not seen again in comics until showing up in backup reprints in 1972 issues of Mister Miracle, and those led to them getting their own two-issue reprint series in 1973. The cover of that first-of-two-issues is seen below (with its crystal-clear color scheme). Please don't ask me which coloring I like better because I think they're both superb in different ways! Of course there's another difference between the two covers. I never before gave any thought to the five gunners that were added in the foreground of the newer version, but now I'm crazy-curious to know who drew those figures. E. Nelson Bridwell edited the two-issue series and the cover to the second issue was drawn by the unusual team of Carmine Infantino and Joe Orlando, but those facts offer no insight as to the artist responsible for these bad guys. Ideas, anyone?